If you'd like to click on the photo of the glowing Iron Fist above, it'll take you to my Screen Rant Feature entitled Is Iron First Really The Worst Marvel-Netflix Show? There's a simple one word answer, but the couple of thousand words elaborates in greater detail. Iron Fist faces my kung fu finisher: The Clacking of the Furious Keyboard. #IronFist is like the story of the Trump kids being harrassed by some weird, homeless, curly-haired, white kung fu guy. #IronFist is weird. It feels unfinished. As if the filmmakers didn't pick the best takes of each scene and went with rehearsal takes. #IronFist might be the first television series made up entirely of deleted scenes edited together. For a kung fu superhero who's shirtless a lot, Danny Rand has the least impressive physique. Hugh Jackman in 2000 would laugh at #IronFist. 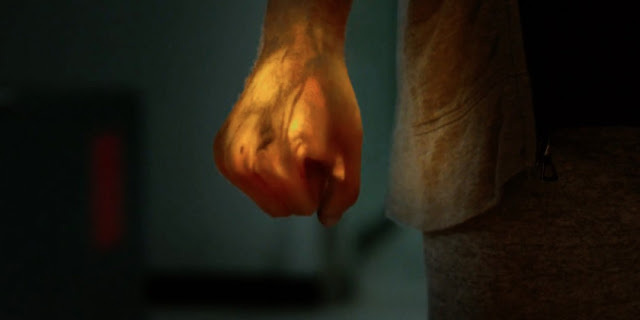 If #IronFist revealed the Hand is responsible for the phrase "Talk to the Hand," that would at least make them seem really evil. The #Highlander homages nee Immortality are kinda neat, but if #IronFist wants a Central Park sword duel, it shoulda been on the Bow Bridge. Watched the whole season. Finn Jones miscast, not because he's white. He never comes across like a martial artist, much less the #IronFist. Every time Finn Jones fights he looks like Leonardo DiCaprio in The Beach. Even his stuntmen do. #IronFist fights are never once convincing. Maybe #IronFist should've cast an Asian-American. They definitely should have cast someone charismatic who is a believable martial artist. #IronFist is also a show where no one with bloody hands washes their hands before doing things like signing forms or typing on a laptop.